Vern Clevenger is possibly the Eastern Sierra's most established and well-known explorer, advocate, photographer and educator. Though his heart is in the Sierra Nevada, his photography and workshops range from Mammoth Lakes, Yosemite National Park, Sequoia and Kings Canyon National Park to Big Sur in the United States and the beautiful regions of Provence, France and Venice, Italy in Europe. Vern used film cameras until 2010 for the initial exposure. These days he incorporates digital processes to produce constant improvement in his art prints, but he remains faithful, as well, to fundamental principles of classical photography. He now pursues his passion to explore the “Visionary Wilderness” using the incredible the Canon 5DS, the Sony A7R in the back-country and Adobe Lightroom image processing software. Vern considers himself to be a "fine print-maker" just as much as a "fine-art photgrapher". 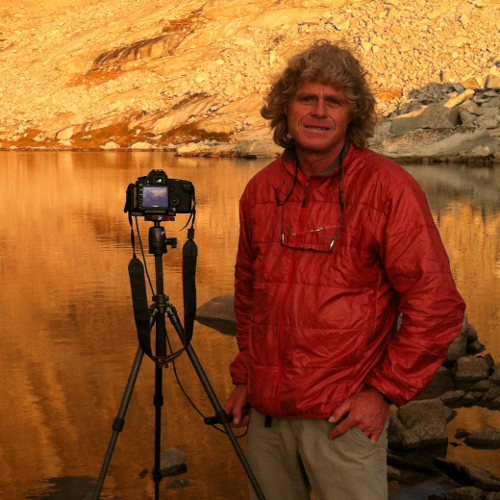 Vern calls Mammoth Lakes home and has his gallery there. When he isn't at work on his photographs he is drawing on the inspirational beauty of the mountains to develop new course material for his workshops. Vern is honored an grateful to have received this kind review from Mary Vocelka, Derrick Vocelka and Andrea Lawrence. Vern Clevenger’s acute ability to respond with such an unerring sense of place—to feel and to frame a day’s shifting light, a season’s shifts of color and mood, and the constant drama of mountain landscapes—has evolved from an adventure-filled life of sojourning in the Sierra Nevada. His legendary Yosemite climbs, his record first ascents, and more than 40 years of ramblings over the range’s peaks and trails have given Vern the experience of wildness he so powerfully expresses. For Vern, capturing these Sierra wilderness photographs has involved taking time to be with these places. His images share special mountain moments deeply lived. They are the offerings of his “sierra sojourns” as an adventure of art. Born in 1955 in Oakland, California, Vern Clevenger spent summers with his family in Yosemite National Park, where he watched some of the first ascents of El Capitan in the early 1960s from the Valley meadows. While climbing in Yosemite during the 1970s Vern became both an adventurer and an artist. Yosemite National Park Museum Curator Jack Gyer and Museum Technician Bea Weiss first introduced Vern to the worlds of art and photography and mentored his early growth. Master photographer Steve Solinsky, a graduate of UC Berkeley’s Department of Architecture, inspired a sense of light and structure into Vern’s compositions. Fellow climber and friend Galen Rowell encouraged Vern further to turn his backcountry enthusiasm into opportunities for adventure as well as photography. As Vern’s lifelong love of the mountains found artistic outlet, he soon moved from 35mm to large format cameras. He also developed meticulous darkroom skills and established a long-term dedication to the Dye Transfer process. Ever an inveterate mountaineer, Vern Clevenger hauled his heavy 4 x 5 cameras all over the High Sierra seeking images that convey his experiences of this alpine world through essences of light and reflection. For three decades, his old traditional choice of equipment required significant time in the field to set up shots that show thoughtful consideration of subjects and demonstrate care for composition. It also captured and recreated beautiful, true color with the finest detail as it imparted strong aesthetic statements. The world of photography has seen amazing changes in the last several years. More than just a “mountain-man,” Vern Clevenger is a true “mountain family-man.” His wife Margaret, son Dylan, and daughter Sabrina have shared every step of Vern’s adventures and artistic journeys. Vern and Margaret met in 1978 at Tuolumne Meadows where their first date was a hard climb. They soon married and spent the next decade climbing the monolithic granite walls of Yosemite and mountaineering throughout the Sierra Nevada and Himalayan Mountain Ranges. 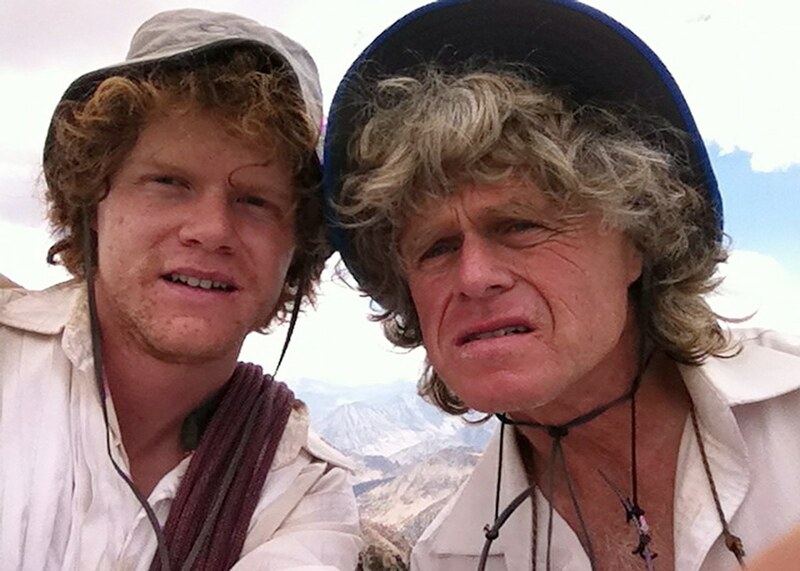 In 1992, 2 1/2 years after the arrival of son Dylan, the Clevengers made a family hike of The John Muir Trail, beginning in Yosemite and 30 days later celebrating Dylan’s third birthday on the summit of Mt. Whitney. Vern and Margaret remember surprised fellow hikers who would first come upon Dylan, running slightly ahead of his parents in diapers and a tank top with a whistle around his neck and bells on his shoes. In 1999, two-year-old daughter Sabrina made her first serious backpacking trip to remote Golden Bear Lake in Center Basin, Sequoia National Park. During the summer of 2000, when Sabrina was three and Dylan at ten could carry his own pack, the Clevenger family hiked the entire 212-mile length of the John Muir Trail together once again. They even claim to have enjoyed it—including the days when thunderstorms kept them all tent-bound with only a pack of cards for family entertainment. Both children were raised in a mountain lifestyle. Portions of every summer were spent backpacking into wild places deep in the Sierra Nevada Range. In winters, they skied their beloved Mammoth Mountain. Throughout his professional career, Vern’s family has helped him review thousands of images and has thoughtfully guided his selections for prints. As the children grew, operating the Vern Clevenger Gallery of Fine Photography was always a whole-family enterprise. Located in Mammoth Lakes, California at the foot of the Eastern Sierra, the Clevenger Gallery and Studio displays Vern’s impressive breadth and accomplishment as an established international landscape and architectural photographer. Gallery visitors who have recently sojourned in the nearby mountains themselves are often struck most profoundly by Vern’s images of the Sierra Nevada. For fellow sojourners in the Sierra, the images collected here share experiences of a landscape at once breathtaking in its familiarity, yet always startlingly new.